Cardiff: Alex Hales made an unbeaten 58 to lead England to a thrilling five-wicket victory over India on Friday that levelled the Twenty20 series at 1-1.The hosts needed 12 runs off the final over, and man-of-the-match Hales blasted the first ball for six to bring up his fifty before England reached their target of 149 with two deliveries to spare. "The unit as a whole did really well," England captain Eoin Morgan told Sky Sports. "To get over the line has boosted our confidence. "The momentum does ebb and flow throughout the game and the series. Alex played magnificently today. Small partnerships here and there are very powerful when you're chasing. "India, who won the first match by eight wickets, started poorly after losing the toss and slumped to 22 for three. Rohit Sharma skied a catch off Jake Ball, Shikhar Dhawan was carelessly run out after dropping his bat, and Lokesh Rahul, fresh from a brilliant unbeaten century in Manchester, was bowled by Liam Plunkett. India captain Virat Kohli (47) and Suresh Raina (27) rebuilt the innings with a patient partnership of 57 and former skipper MS Dhoni (32 not out) helped his side plunder 22 runs off the final over to lead the touring side to a respectable total.England also started badly and lost Jason Roy (15), the in-form Jos Buttler (14) and Joe Root (nine) as they struggled to 44 for three. 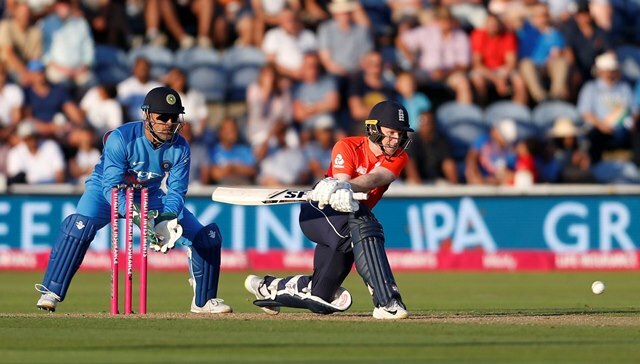 But Hales and Morgan added 48 for the fourth wicket and Jonny Bairstow struck two sixes in a quickfire 28 to increase the momentum.Hales hit three sixes and four fours in his 41-ball knock to lead England home, and the teams head into the final match of the series in Bristol on Sunday all square. "It's two very strong teams, both at the top of their game, so it should be a cracker," Hales said.